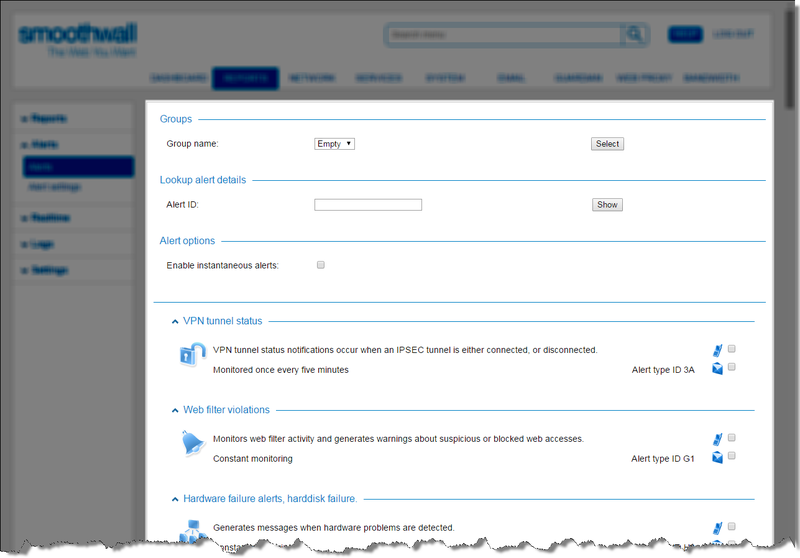 Your Smoothwall contains a comprehensive set of incident alerting controls. Alerts are generated when certain trigger conditions are met. Trigger conditions can be individual events, for example, an administrator login failure, or a series of events occurring over a particular time period, for example, a sustained high level of traffic over a five minute period. Some alerts allow their trigger conditions to be edited to customize the alert sensitivity. Some situations are constantly monitored, particularly those relating to critical failures, for example, UPS and power supply alerts. It is possible to specify two-trigger conditions for some alerts – the first acts as a warning alert, and, in more critical circumstances, the second denotes the occurrence of an incident. You access the alerts and their settings on the Reports > Alerts > Alerts page. VPN Tunnel status notifications occur when an IPSEC Tunnel is either connected, or disconnected. Monitored once every five minutes. Note that a Unified Threat Management serial is required to view this alert. For more information, contact your Smoothwall representative. Monitors web filter activity and generates warnings about suspicious or blocked web accesses. Note that a Guardian license is required to view this alert. For more information, see About Guardian. Generates messages when hardware problems are detected. Generates messages when the license is due for renewal or has expired. Monitored once an hour. Generates messages when a hardware failover occurs, or when failover machines are forced on and offline. Validates the Smoothwall VPN certificates and issues warnings about potential problems, or impending expiration dates. Generates messages when server power switches to and from mains supply. Monitors outbound access activity and generates warnings about suspicious behavior. These alerts are triggered whenever the system resources exceed predefined limitations. Monitors firewall activity and generates warnings based on suspicious activities to or from certain IP addresses involving particular ports. L2TP Tunnel status notifications occur when an L2TP (Layer 2 Tunnelling Protocol) Tunnel is either connected, or disconnected. This alert is triggered whenever a critical system service changes statues, that is, starts or stops. This alert is triggered when an interface has failed. An additional alert will be sent when an interface becomes available again. Monitors reverse proxy activity and generates warnings about connectivity issues. Checks on remote services for activity. Health monitor alerts are intended to enable you to keep an eye on various aspects of your network which are usually outside of the remit of the Smoothwall. This alert is triggered when connectivity to an upstream proxy fails or returns. Note that a Guardian license is required to view this alert.For more information, see About Guardian. These alerts are triggered by detection of malware being relayed via SMTP or downloaded via POP3. Note that you may not see this option if Anti-Spam is not installed. For more information, see About Anti-Spam. Note that a Guardian license is required to view this alert. For more information, contact your Smoothwall representative. Monitors instant messaging chats activity and generates warnings based on excessive use of inappropriate language. Catches test alerts generated for the purposes of testing the Smoothwall Output systems. Generates an alert whenever a user uses an inappropriate word or phrase in IM chat conversation. Monitors both the Secure Shell (SSH) and Web Interface services for failed login attempts. These alerts are triggered whenever the traffic flow for an external interface or bridge exceeds certain thresholds. This alert is generated when a client is unable to provide correct credentials for NTLM authentication. Monitors the system for new updates once an hour. These alerts are triggered by violations and notices generated by the intrusion system by suspicious network activity. Watches the email queue and informs if the number of messages therein exceeds a certain threshold. For more information, see About Anti-Spam. This alert monitors for Global Proxy activity. Alerts are triggered when client misconfiguration, or potential abuse is detected. This alert is generated whenever the system is booted; that is, is turned on or restarted.